(from left to right) WCHC President & CEO, John Ness; WCHC Board Chairman Susan Stephens; and Conowingo Lions Club President Mike Wilson are excited for the nonprofit’s future services. 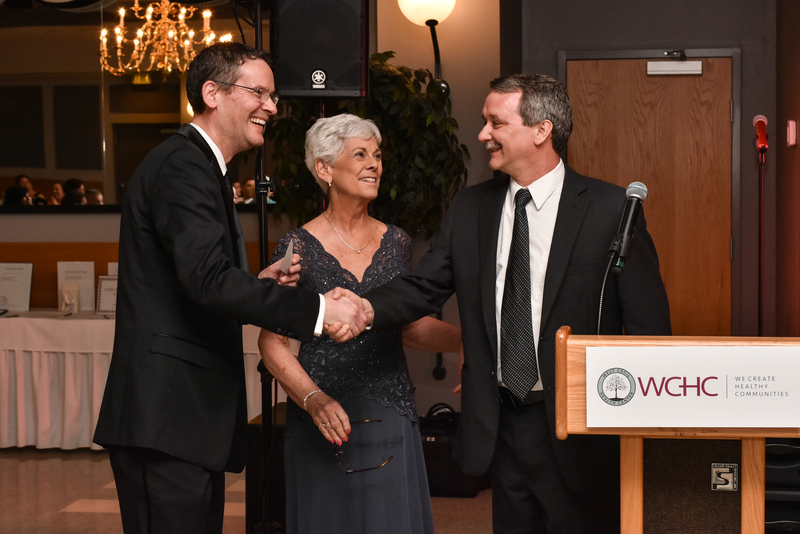 To celebrate 10 years of providing access to high quality health care to Harford and Cecil Counties, West Cecil Health Center (WCHC) hosted its fourth annual gala on Saturday, April 14, 2018 at Rising Sun Banquet Hall. With more than 100 attendees, the event was evidence of a community that cares deeply about each other’s wellbeing. Among those honored was the Conowingo Lions Club, a group that has supported WCHC since inception. What no one anticipated was a surprise donation to launch the next step for WCHC’s services – $25,000 to help start a vision program. WCHC continually strives to meet the community’s health care needs in Cecil County, Harford County and beyond. What began as a small operation in Conowingo has now expanded to a large, state-of-the-art facility with additional locations in Perryville and Havre de Grace. WCHC provides primary care medical services in a unique setting that integrates direct access to behavioral health, dentistry, women’s health and enabling services. The enabling services include outreach and enrollment, and interpreting. Additionally, the Conowingo office offers the convenience of an on-site pharmacy and lab. Additionally, gala attendees learned more about the ALICE (Asset Limited, Income Constrained, Employed) statistics in Maryland, which according to the United Way of Central Maryland’s latest ALICE report, qualifies a staggering 35 percent of Cecil County households and 34 percent of Harford County households as ALICE/poverty. WCHC launched their $10 for 10 months campaign at the event, which helps allow the nonprofit to care for individuals and families without health insurance who otherwise could not afford care. WCHC thanks its dedicated board of directors for making the gala a success. Stephanie Garrity, Vice Chairman; Jeffrey Coale and Bernie Brown were recognized for a decade of dedication. The organization also extends its appreciation to Susan Stephens, Board Chairman; John Armstrong, Treasurer; Betty Johnson, Secretary; Linda McKinnon; MJ Cook; Pam Whitecavage-Kincaid; Vickie Ensor Bands; Leslie Clark; and Glenn Jensen. As a Federally designated Community Health Center, WCHC is a 501(c)(3) nonprofit that relies on grant funding and the generosity of donors to support its mission of ensuring every person in need of healthcare is able to receive it. To donate to the $10 for 10 months campaign, visit westcecilhealth.org/10for10; for more information about WCHC, call 443-731-3144, “like” West Cecil Health Center on Facebook or visit westcecilhealth.org.